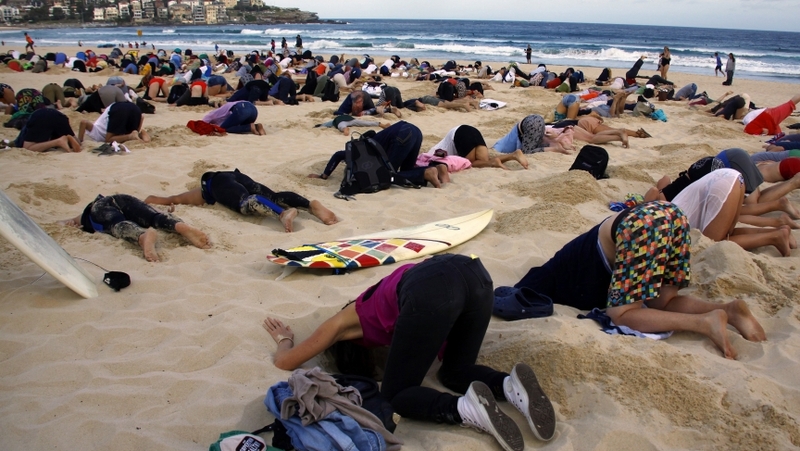 A group of around 400 demonstrators participate in a protest of Australia’s elimination of its carbon tax by burying their heads in the sand. The photo was taken at Sydney’s Bondi Beach on November 13, 2014. Australia has the developed world’s highest per capita emissions of greenhouse gases. World leaders met November 15-16, 2014, at Brisbane, Australia, for the G20 summit. President Barack Obama spoke at the University of Queensland during the summit on a number topics, including his announcing of a $3 billion contribution by the U.S. to an international fund to help poor countries cope with the effect of climate change. “Today, I’m announcing that the United States will take another important step,” he said. “We will contribute $3 billion to the Green Climate Fund [UN] to help developing nations deal with climate change.” speech made reference to Queensland’s Great Barrier Reef, which the Intergovernmental Panel on Climate Change (IPCC) has warned could be at risk if more is not done to reduce carbon emissions. “I have not had time to go to the Great Barrier Reef and I want to come back,” Mr Obama said. The US contribution to the climate fund doubles what other countries had previously pledged ahead of a November 20 deadline. Mr Obama told the audience that every nation has a responsibility to act on climate change, including Australia. In his speech, Mr Obama also spoke about the situation in Ukraine, describing Russia’s actions as aggressive. Speaking at an earlier news conference in Brisbane, UN secretary-general Ban Ki-moon said he hoped other G20 leaders would contribute to the fund as did Obama. “The transition towards a low-carbon, climate-resilient future is accelerating, I urge other leaders and major economies, especially at the G20, to come forward with contributions that will sustain this momentum”, the UN secretary said. Carbon pricing had been implemented for Australia’s 500 largest carbon dioxide (CO2) emitting companies, which are those companies that emit more than 25,000 tons of CO2 or supply or use natural gas, starting on July 1, 2012. CO2 was taxed at $22.60 per ton of CO2 emitted by the highest 348 emitters. Under the Carbon Farming Initiative (CFI), farmers and land managers could earn carbon credits by storing carbon or reducing greenhouse gas emissions on their land. The credits could then be sold to people and businesses wishing to offset their emissions. The program included credits earned from activities such as reforestation, savannah fire management and reductions in emissions from livestock and fertilizer use. CFI credits could also be sold to international companies. Australia had legislated a renewable energy target designed to ensure that 20 per cent of electricity would come from renewable sources by 2020. Following the 2013 federal election, Prime Minister Tony Abbott announced plans to scrap the controversial tax. He then put pressure on labor leader Bill Shorten to support legislation repealing the tax by the senate. The Australian Senate voted by 39 to 32 votes to repeal the tax on July 17, 2014. Abbott claims that the tax cost jobs and forced energy prices up. The G20 summit meeting came just days after President Obama and Chinese President Xi Jinping announced a deal on climate change that raised hopes for a comprehensive international deal next year in France.